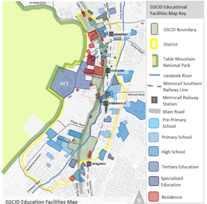 The GSCID is located in the area surrounding the University of Cape Town. The area is, as such, a university town. MCA undertook extensive research and analysis to determine the existing challenges and opportunities of the area, identifying civic and non-governmental entities such as the Rosebank Ratepayers Association and the Friends of the Liesbeek River for collaborative projects and initiatives in the area. This culminated in a Strategic Development Framework underpinned by the concept of a Learning District – creating a local identity and branding strategy. The project included public workshops and extensive stakeholder consultation, along with both a spatial and management framework.